The Fiat 500 Abarth. More than just a cool emblem on a fast car, the 500 Abarth is a descendant of legendary performance cars and championship racers. Now, you can drive your 500 Abarth to the grocery store and that will be fun, but you'll miss out on the considerable capabilities of this car. To keep this from happening, Fiat includes "The Abarth Experience", a full day of high performance driving instruction with every purchase of a new Fiat 500 Abarth. The 2015 Abarth Experience calendar has been posted. 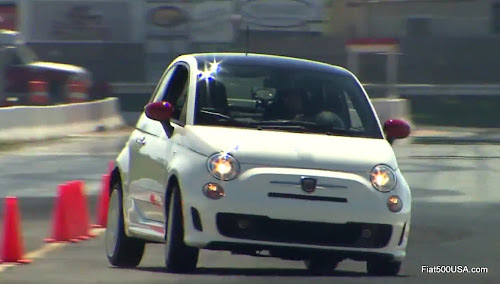 During the Abarth Experience, owners learn from professional racing instructors how to exploit all the performance of the Fiat 500 Abarth, in a safe and controlled race track environment. Update: This year there will be both manual and automatic transmission equipped cars available at the Abarth Experience! The 2015 schedule that is posted is preliminary, and there are more venues being added. Make sure you visit the site as soon as possible because the events begin next month and, if you don't see a venue near you, check back over the next few weeks for the full schedule to be posted. You need to have taken delivery of your 500 Abarth to register and have your VIN handy.